International Symposium on Kang Youwei's Calligraphic Study & The First Qingdao International Calligraphy Biennale was held in Qingdao between Oct. 27 and 28, 2018. Approximately 200 experts, scholars and calligraphy artists from 16 countries and regions including China, Russia, USA, France, Italy and Japan participated in the event. 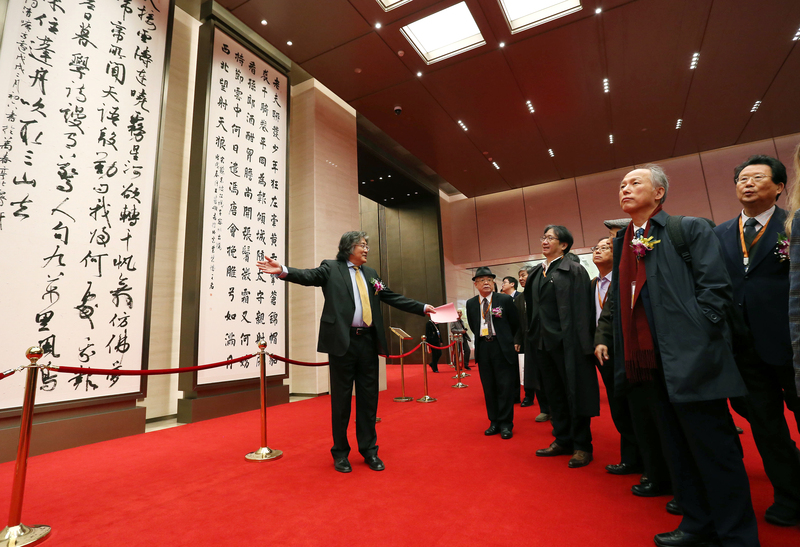 The symposium received more than 60 theses covering many aspects such as the domestic and foreign impact of Kang Youwei's calligraphy study thinking. Famous sinologists such as Pan Weijun, great granddaughter of Kang Youwei, Jean-Marie Simonet, honorary head of the Chinese section at Royal Museum of Fine Arts of Belgium, and André Kneib, professor at INALCO analyzed on Kang Youwei's calligraphy study achievements. Chinese calligraphy. To learn more about Qingdao? During the symposium, Su Shishu, Chairman of the Chinese Calligraphers' Association, held academic exchanges with visiting calligraphers by hosting "International celebrities describing Qingdao with calligraphy" and "Calligraphy masters entering campus and community".